Late Smt Jasodaben Devshi Devji Shah | Oshwal Association of the U.K. 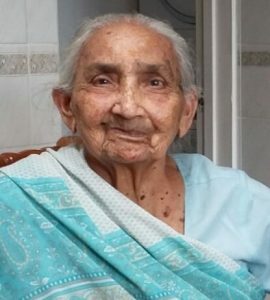 It is with deep regret and profound sadness that we announce the passing away of our beloved Baa – Jasodaben Devshi Shah, Kenton, formerly Finchley and Kenya. She was wife to late Devshi Devji Shah (Maru). Daughter-in-law of the Late Shree Devji Kachra Shah and the Smt. Jethiben Devji of Rafudad,India. Grandmother and grandmother-in-law to Smita and Deepak, Sila and Paresh, Mayuri, Manisha and Hiten, Chatan and Swati, Keval and Jaishree, Hanel and Sonia, Amit and Archna, Bhavin, Khilan, Neil and Jayna, Lena and Neer, Kirpa and Nirav, Bhavni, Arti and Hasmukh, Rina, Parita and Srijan, Heran and Mina, Jinal, Alpesh, Prinay, Nimesh, Tej, Aneesha. Great Grandmother to Kush, Amiya, Aaryan, Ishaan, Ashiya, Anaiya, Krishen, Suhani, Veer, Treyan, Kian, Riyan, Chandni and Sachin, Nikita and Nikhil, Khilna and Ravi, Dharmika, Kyle, Jasmine.